Aguero lies on the ground as Fellaini is shown red. MANCHESTER CITY STRIKER Sergio Aguero was partly to blame for getting Marouane Fellaini sent off, said Manchester United manager Jose Mourinho after the two fought out a 0-0 draw in the Premier League tonight. 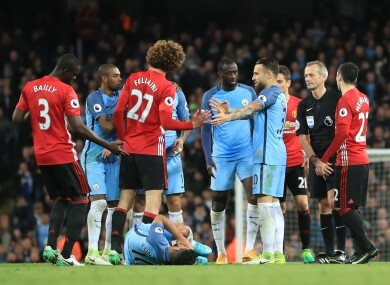 Belgian midfielder Fellaini was red-carded by Martin Atkinson for headbutting Aguero six minutes from time after the City star got to his feet having just been fouled by the United player. “I didn’t watch the Fellaini incident on TV but I spoke with Fellaini,” he told Sky Sports. “He thinks it was a red card because he is Fellaini. I spoke to Martin (Atkinson, referee) — he thinks it was a red card. Aguero’s failure to score — his nine shots the most against United since Cristiano Ronaldo’s 11 for Real Madrid in March 2013 — reflected a match where City played most of the football but lacked the killer touch. “We cannot forget which team we were against tonight,” Guardiola told the BBC. They created two clear chances and I am satisfied. I know how difficult it is to play against Manchester United. “Every game until the last game now will be a final. We have the talent but it’s not easy with so many players behind the ball. Email “Mourinho: 'It's a bit of a red card and a bit of a very smart, very experienced Argentinian player'”. Feedback on “Mourinho: 'It's a bit of a red card and a bit of a very smart, very experienced Argentinian player'”.